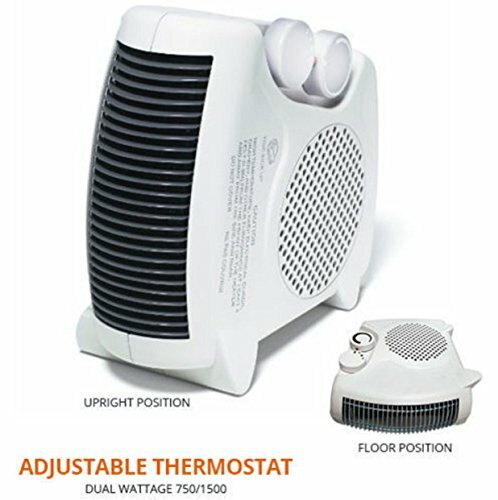 Stay warm this fall and winter without paying a fortune on electricity with this fan forced space heater with thermostat. Three settings: fan for all seasons, high heat and low heat. Features adjustable thermostat, safety overheat protection system and metal safety grille. Use it upright or in horizontal position. Stay-cool body with integrated molded handle. 750 watts on low, 1500 watts on high. 5120 BTU. 120 volts, 12.5 amps. 9 3/4"L x 5"W x 10"H. ETL listed. Mfr. 1 year limited warranty. If you have any questions about this product by Brother123shop, contact us by completing and submitting the form below. If you are looking for a specif part number, please include it with your message.